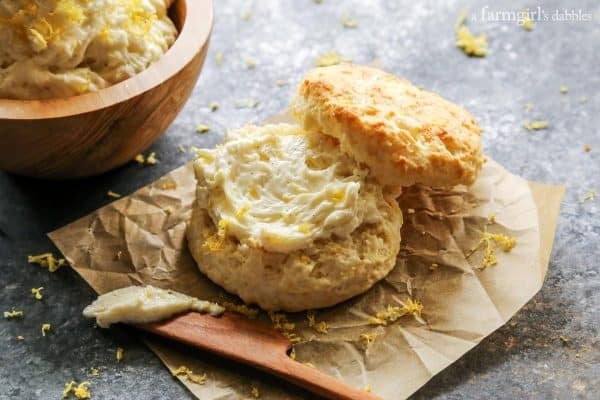 Light and fluffy and ultra tender, these Lemon Cream Biscuits will disappear in no time. I recommend baking a double batch! 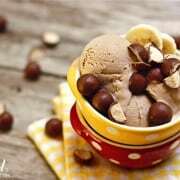 There are a collection of recipes that I return to over and over again, without even bothering to look for substitutes. They are tried and true, always pleasing my family and our guests at the table. And one of those recipes is for cream biscuits. 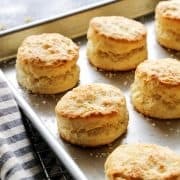 Flaky and ultra tender, and served hot and steaming, those biscuits make everyone’s eyes roll back in pleasure with just one bite. My Lemon Cream Biscuits are a riff on that wonderfully simple recipe that I’ve been depending on for many years. Now with two cream biscuits recipes in my back pocket, my only decision will be is which one to bake today, and which one to bake tomorrow! Since attending White Lily’s Southern Baking Retreat years ago, I became a solid believer in their flour. 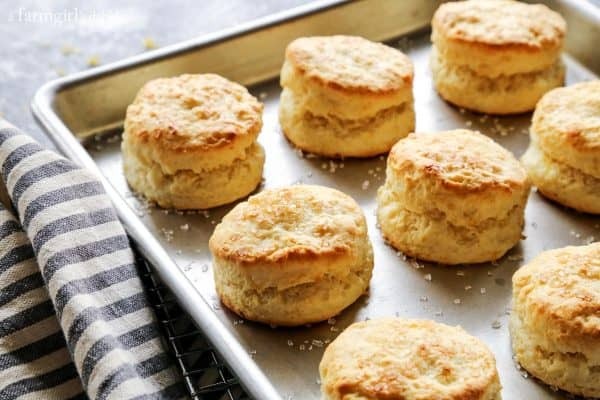 This is where I learned to make tender cream biscuits for the first time, with only two ingredients: White Lily Self-Rising Flour and heavy cream. 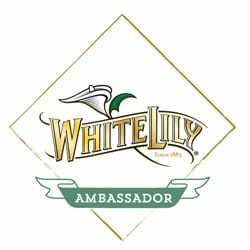 White Lily is a Southern baking tradition that I never grew up with in South Dakota, and now I can’t live without it. 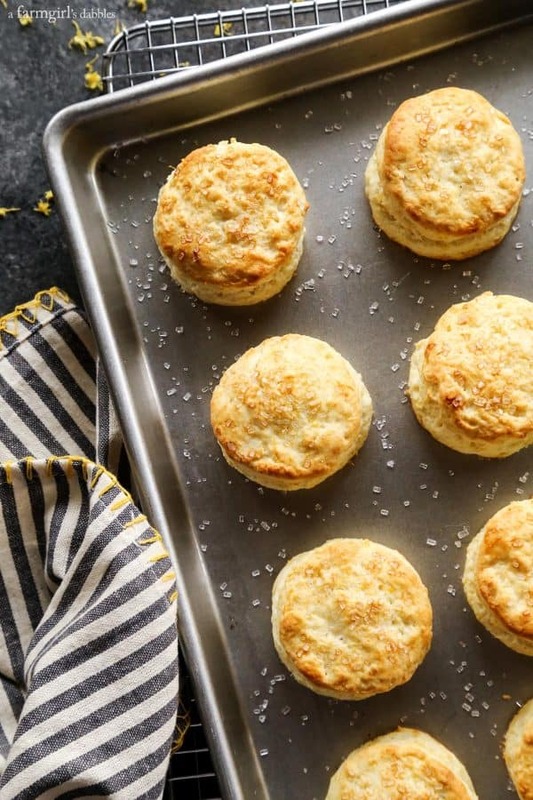 I won’t bake biscuits at home without White Lily flour. My favorite biscuit-making flour is the White Lily Self-Rising flour. 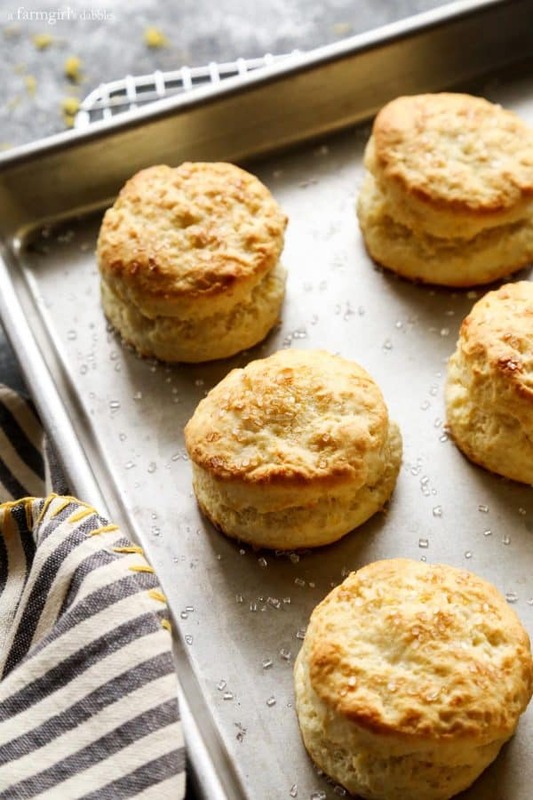 I am guaranteed light and fluffy biscuits every single time. Their tenderness is something that is impossible to put into words. You just won’t know what I’m talking about until you’ve tried it for yourself. My family consists of a bunch of lemon fans. Whether I add its brightness to sweet or savory dishes, it’s always a welcome flavor. In this cream biscuits recipe, I added a good amount of fresh lemon zest to the simple dough. The biscuits themselves are not sweet, and contain no sugar except for the finishing sprinkle of course sugar over the tops. I love the beautifully golden result of the egg wash baked on the biscuit tops. The larger sugar crystals get accentuated, making the biscuits extra pretty. These little recipe upgrades take very little effort, yet give you a completely different cream biscuits experience. Lemon cream biscuits are best served warm from the oven, with soft salted butter. And if you want an extra special treat, make some whipped lemon-vanilla bean butter. 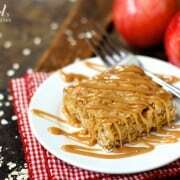 Its sweetened, fluffy goodness is undeniably wonderful. My family absolutely adores this combination of biscuits and butter. Place flour in large bowl. Add lemon zest and whisk to incorporate. With a large wooden spoon, gradually stir in cream to form a sticky dough. Turn dough onto lightly floured surface and fold twice gently to form a ball. Do not knead. Gently pat dough to a generous 1/2” thickness. Cut with floured 2-1/4” round cutter, leaving as little dough between cuts as possible. Take care to push the cutter straight down into the dough, without twisting the cutter. This will ensure a higher rise and layers in the biscuits. Gather remaining dough and pat again to a generous 1/2” thickness. You should get 8 to 9 biscuits with a 2-1/4” round cutter. Discard remaining scraps. Place biscuits on baking sheet, about 2” apart. In a small bowl, whisk together egg, water, and milk. Brush tops of biscuits lightly with egg mixture. Sprinkle lightly with coarse sugar. Bake for about 8 minutes, or until tops are golden brown. Serve hot and fresh. 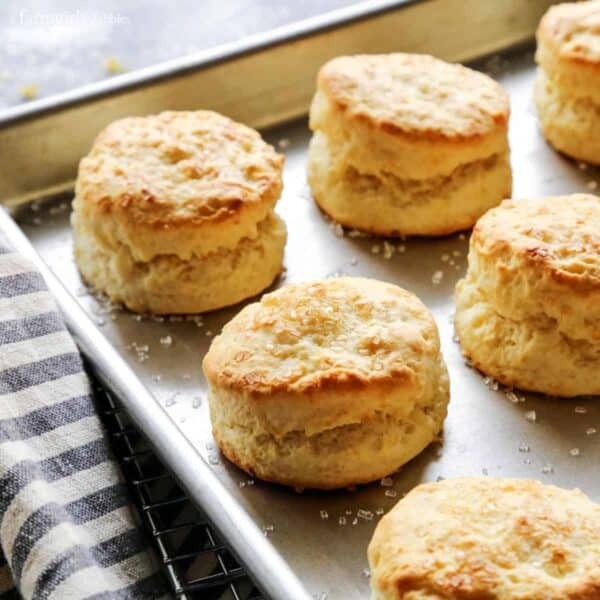 These biscuits are wonderful with whipped lemon-vanilla bean butter. Biscuits adapted from White Lily Cream Biscuits recipe. I love biscuits, and with the lemon cream, I won’t be able to stop eating those biscuits. I die!! These look amazing! this will be my weakness! lemon biscuits!! oh my!! Fresh out of the oven, so GOOD! I love their products and I adore these biscuits. They’re cooked to perfection. These biscuits look like exactly what I imagine the perfect biscuit to look like! Then we think alike. Because they totally are! Thanks, Julianne! These biscuits look sooo perfect! 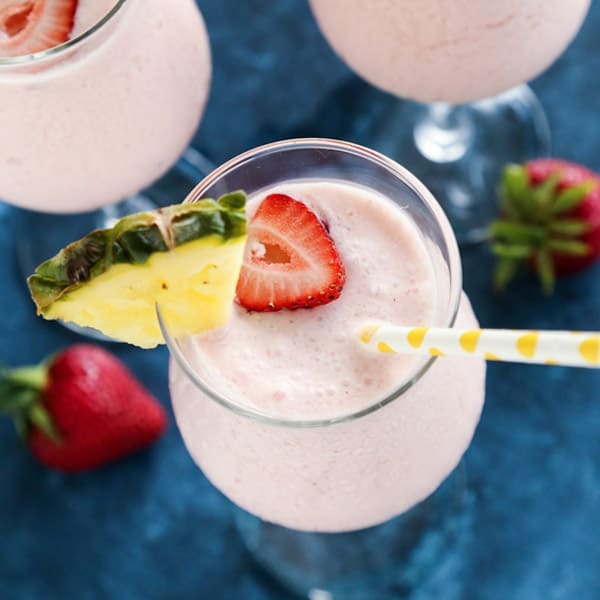 Great recipe for spring! 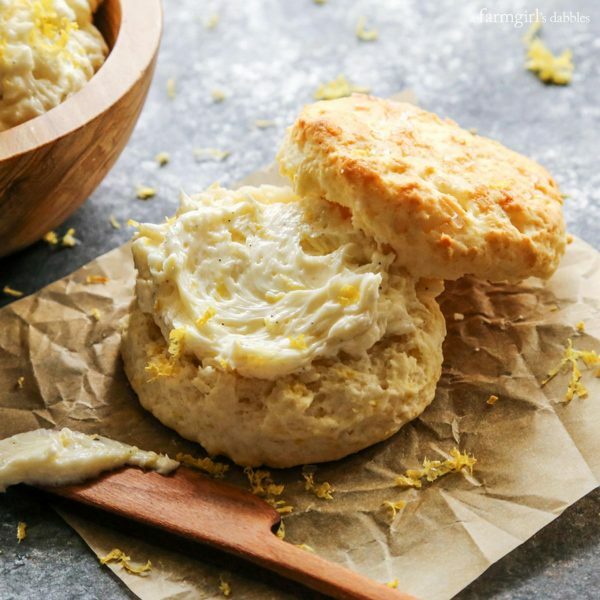 I love all things lemon and these biscuits are over the top amazing! 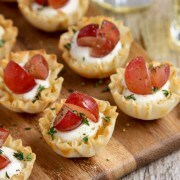 Can’t wait pick up some White Lily Flour and try these! Best biscuit-making flour EVER!! Thanks, Miss. Time to pick up some White Lily Flour as these biscuits sound out of this world!! Yes! Keep it on hand ALWAYS!! Thanks, Liz. I’m a biscuit fiend, and these ones look amazing. Lemon cream biscuits! Just the name makes my heart smile. These sound awesome Brenda! I loved the look of them and then read that you only use the flour and cream. No sugar, no eggs, nothin’ else! I’m excited to try these. They sound amazing. Being in the UK our flour tends to be pretty soft so I’m hoping that mine turn out as fluffy as yours did! Thank you so much! 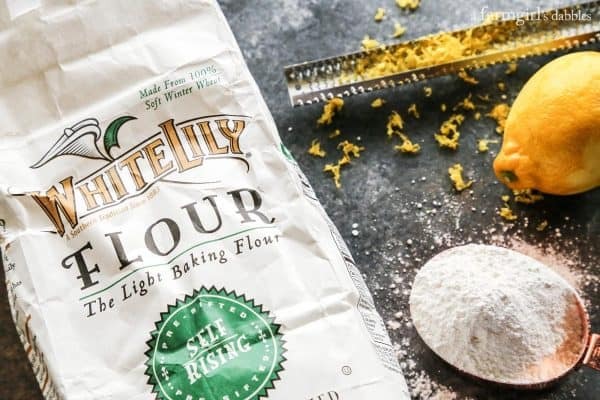 The White Lily self-rising flour is definitely beautiful: http://www.whitelily.com/products/traditional-flour/enriched-bleached-self-rising-flour – and includes some leavening and salt. It makes THE BEST biscuits! I seriously want to eat EVERYTHING lemon! I’ve never met a biscuit that I didn’t love, so I need these! Lemon is always a favorite here as well. These biscuits have been requested over and over! These lemon biscuits look amazing. O.M.G. Seriously, I need a dozen of these ASAP! Danger danger! These biscuits were made for me. That lemon zest, that butter. I want it all.